Image taken by Lynn Hilborn, WhistleStop Obs,Grafton, Ontario. on November 7, 2013. TEC 140 @f5.3 and ML8300 camera with Baader filters. LRGB L 16x45s, RGB 15x30s all binned 1x1. In 1890, American astronomer E. E. Barnard, observing visually with the Lick Observatory 36-inch telescope in California, discovered an exceptionally bright nebulosity adjacent to the bright Pleiades star Merope. IC349 is a very small object, about 20 arc seconds across. 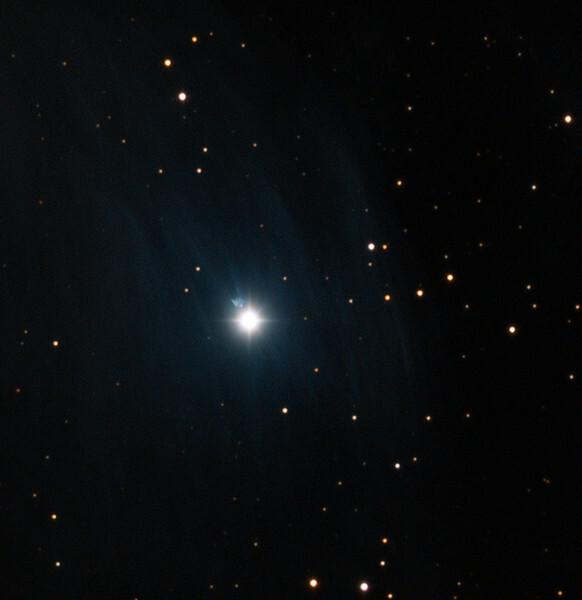 "Barnard's Merope Nebula." IC 349 is so bright because it lies extremely close to Merope -- only about 3,500 times the separation of the Earth from the Sun, or about 0.06 light-year -- and thus is strongly illuminated by the star's light.